BBC News explores the issues surrounding the detention of foreign terrorism suspects at the Guantanamo Bay detention centre in Cuba, the military tribunals being held to try some of them, and the Obama administration's likely moves to close the centre. What has President Obama said so far concerning Guantanamo? Closing the controversial the camp at the US naval base in Guantanamo and ending the use of what have been termed "enhanced interrogation techniques" are central planks of his security agenda. President Obama told Time magazine that if his administration had not "closed down Guantanamo in a responsible way, put a clear end to torture and restored a balance between the demands of our security and our constitution" within two years of taking office, then it would have failed. So what steps is President Obama going to take? One of his first acts as president was to request the suspension of all military tribunals there. A motion filed jointly by the White House and the US Department of Defense sought a 120-day suspension of trials. The judges at Guantanamo quickly agreed to halt the cases of a Canadian accused of killing a US soldier in Afghanistan and five men charged in the 11 September attacks. Similar decisions are expected in the other 13 pending cases. So if military tribunals are suspended, what happens then? It gives the Obama administration time to work out exactly how it will proceed in a highly complicated situation. This includes reviewing the much-criticised system of military commissions, evaluating whether there is a case for prosecution of those detainees not approved for release or transfer, and if so where they should be tried. The broad plan seems to be to close Guantanamo and move the trial process to the United States, but this is far from straightforward. For example, some of the evidence admissible in a military tribunal would not be accepted in a US civilian court. So a hybrid system combining civilian court rules with courts martial procedures is being examined. There will also be a new push to get countries to accept those prisoners already cleared for release. Another problem is that some prisoners cannot be sent back to their home countries because they run the risk of being tortured. How many prisoners were facing a military tribunal? The Bush administration had plans to try about 60 to 80 of the 245 foreign inmates still being held at Guantanamo. The camp once had some 750 prisoners. As they stand, how do the current tribunals/commissions work? They were established in 2006 by the Bush administration to try terror suspects under separate rules from regular civilian or military courts. They are made up of between five and 12 US armed forces officers. However, if the death penalty is sought, then at least 12 members have to be on the commission. A qualified military judge presides over the hearing. To get a conviction, at least two-thirds of the commission members have to be in favour. For a sentence of death, which can be sought if death occurred as a result of a defendant's action, all 12 commission members have to agree. The final decision on carrying out a death sentence is taken by the US president. Are the tribunals held in public? The commissions are in public though the "public" is defined as members of the press and national or international organisations, agreed to by the secretary for defence. The tribunal can be closed if the safety of individuals or the protection of intelligence is required. What safeguards are there for the defendant? In a 12 June 2008 decision, the US Supreme Court ruled that foreign suspects at Guantanamo had the right to seek a full judicial review of their detention in civilian courts. The court accepted arguments by lawyers for two prisoners, Lakhdar Boumediene and Fawzi al-Odah, that the Military Commissions Act (MCA) unlawfully deprived them of their right under the principle of habeas corpus. Habeas corpus is an ancient right acquired from English law under which a prisoner has to be brought before a court to have his/her detention justified. What did the Bush administration say about habeas corpus? It argued that habeas corpus did not extend to Guantanamo Bay as it was not US sovereign territory and that the system it had set up itself provided adequate safeguards. These are that the accused will have the presumption of innocence and proof of guilt will have to be "beyond reasonable doubt". He cannot be forced to testify against himself. He will have a military lawyer and can also have a civilian one. Also, the accused is able to be present for the proceedings unless he is ruled disruptive, to present evidence and witnesses in his defence and to cross-examine any witnesses against him. He has the right to be shown the evidence against him, though this will be in summary form if the judge decides that sources are kept secret for security reasons. Mr Obama's choice for attorney general, Eric Holder, has said the commissions do not provide enough legal protections for defendants. If convicted, a defendant can appeal to a Court of Military Commission Review and then to the United States Court of Appeal, a civilian court. From there, an appeal might go to the US Supreme Court itself. What drawbacks are there for the defendant? There are some serious differences between the commissions and normal US law. The decision to convict is by two-thirds vote, not unanimity as in a US jury trial. The commission itself, in effect the jury, is made up of military officers not members of the public. A key difference is that any evidence, including hearsay (in which a witness says he/she was told or heard something from someone else), and some obtained by coercion, is allowed, "if the military judge determines that the evidence would have probative value to a reasonable person". Evidence that contains classified information will be summarised to protect its sources, so the accused will not have a complete picture of the case against him. What about evidence obtained by torture or coercion? Evidence obtained under torture is not permitted, but evidence obtained by coercion can be. The interrogation technique of "waterboarding" was not classified as torture by the Bush administration. However, the Obama administration seems set to take the opposite view. Eric Holder has said categorically that "waterboarding is torture". What is currently happening at Guantanamo? Alleged 9/11 mastermind Khalid Sheikh Mohammed and his co-accused Ali Abd al-Aziz Ali, Ramzi Binalshibh, Mustafa Ahmad al-Hawsawi and Walid bin Attash appeared at a pre-trial hearing on 19 January. The proceedings went ahead despite a request by both the defence and prosecution teams for a delay. The defendants, who face charges including terrorism, hijacking and murder, have all said they do not want to be represented by US military lawyers. Their previous appearance was at a hearing in December when they came face to face with relatives of those killed in the 11 September attacks. In May 2008, the Pentagon dropped charges against Saudi citizen Mohammad al-Qahtani - the man alleged to have been the "20th hijacker" in the 11 September 2001 attacks. The official overseeing the trials, Susan Crawford, said in January 2009 that Mr Qahtani, who remains at Guantanamo, had been tortured. In March 2007 an Australian, David Hicks, pleaded guilty to helping the Taleban and was sent back home to serve a nine-month sentence. 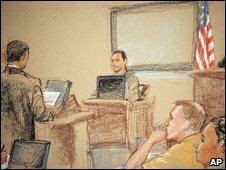 On 6 August 2008, a six-member military jury convicted Osama Bin Laden's former driver, Salim Hamdan, of supporting terrorism. He was sentenced to 66 months. As he had spent time in pre-trial detention, his 66-month sentence was completed in November 2008 and he was returned to his home country of Yemen.